frontier was the Ocmulgee River. In 1821 it was the Flint River and in 1827 the Chattahoochee. Migration was swift. sell their lands without the entire Creek Nation agreeing. By 1824 it was quite clear that Gov Troup and the settlers in Georgia were going to keep moving west and that the Creek should give up the lands and move father west. President Munroe got involved and in Feb 1825 summoned all of the chiefs of the Creek Nation to meet at Indian Spring to consider terms for selling all of their territory between the Flint and the Chattahoochee. There were nearly 400 Creek leaders at the meeting. 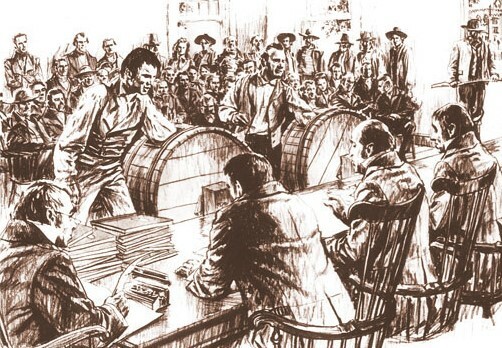 The dissenters left the meeting, leaving those in favor to vote the next morning. The terms were that the US Government would give them land of the same quality and quantity that they had in Georgia, it would be beyond the Mississippi River and the US was to pay them $5,000,000 in cash for improvements that they had made to the Georgia lands and to help pay for the move. They were to have 18 months to make the move. McIntosh was killed by the Creek who were against the sale. Great fear rose of an Indian uprising. continued on the basis of the Indian Springs Treaty. He ordered the land to be surveyed. When Adams told him to stop and that he would use military force to stop the surveying, Troup told him he would meet force with force. The state troops were called up immediately to the cry "Troup and Treaty". Meanwhile another meeting og Creek Chiegs was called at the Creek Agency, and the Indians consented to abide by the Indian Springs treaty. In short order they moved to the Western lands and opened up more land for settlement. 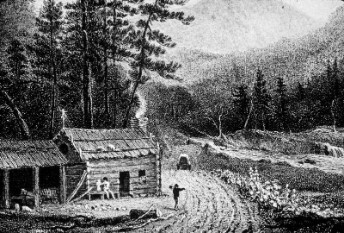 The land was surveyed off, lots were numbered and the land lottery of 1827 contained lands that would later become Marion County as well as Troup, Meriwether, Harris, Talbot, Muscogee, Randolph and Lee. Every Georgia male, every Georgia widow with minor children, and every family with minor orphans had a chance to draw land in the lottery. Some drew blanks of course, but others were able to win land in the new unsettled area. Most sold their land to others who were more interested in moving to a new land. 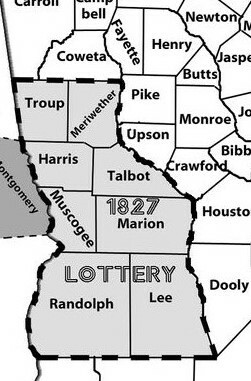 In December 1827, Marion County was created out of land that had been drawn off of the lottery. horseback and on foot. First they needed to find water n their land, then put up a tent or a one room cabin until they were able to build something more. When a home was built, the land was cleared and fences built. Lands lying on the creeks and rivers were considered the most fertile and those were quickly taken. Cotton gins, grist mills and saw mills were constructed on the creeks which furnished power to run the mills. By 1830 census the total population of Marion County was 1327 white people and 109 slaves. Initially Marion was laid out in four militia districts. The first courthouse was at Horry from 1827 to 1838, but its location is unknown. Horry is no longer a town. Because of the expanding population in 1832 there were five militia districts and in 1836 there were six. In 1832 land was annexed from Marion to Talbot Co and in 1830 it established a line between Marion and Sumter Co.
burned 3 Nov 1845, burning most of the records. It was rebuilt by 1848 by L W Wall and that building is still standing. It was later sold to the Tazewell Masonic Lodge. through various Creek towns in Alabama, and on up to Savannah where the Indians carried their good for trade to the English. D N Burkhalter donated 100 acres to the county for the land that Buena Now stands in January 1849. Part of this was used for the square in the middle of town, and the other portions for town lots which were sold and the proceeds used to pay for the building of the Court House. Enock Williams established a brick yard near Buena Vista and he made the brick for the court house. was given to Marion. Part of Marion was transferred to Talbot and part to Taylor. help at home. Reconstruction stuck the state hard, including Marion County. By 1870 things were turning around for the county.